Valentine’s Day is full of treats and special surprises for all of our loved ones. Pet owners need to be aware, though, of how their holiday plans could impact some of the most important critters in their lives. Many common Valentine’s Day candies and confections are not so sweet for our four-legged loves. 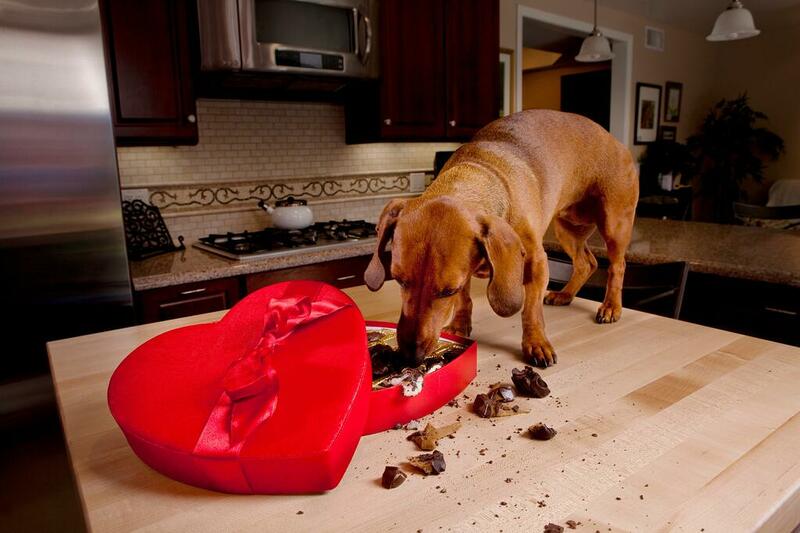 Do you know what Valentine’s Day Pet Dangers are lurking in your Whitman Sampler this year? What Valentine’s Day is complete without a little chocolate? Americans spend billions of dollars on these types of chocolate-y treats every year. We love chocolate. Unfortunately, it seems, so do our pets. Chocolate ingestion can be a very serious matter in our pet patients, and rounds out the list as a top concern when it comes to Valentine’s Day Pet Dangers. In general, the darker the chocolate the bigger the danger. A pet must ingest far less baking chocolate to reach toxic levels than milk chocolate. White chocolate, while less likely to cause theobromine or caffeine toxicity, contains large amount of fat, which can predispose a patient to pancreatitis. These decadent treats often find their way into cookies and baked goods. While many people appreciate the macadamia nut, it is a food that is best for pets to steer clear of. Within about 12 hours of ingestion, pets who eat macadamia nuts may experience weakness, lethargy, vomiting, and increased body temperature. Not to be left out, other members of the nut family can cause problems, too. While not inherently toxic, peanuts, almonds, pecans, and walnuts all contain high concentrations of fats and oils that can lead to digestive upset and pancreatitis. Who doesn’t love a good chocolate covered raisin? Your pets should not get to have an opinion on the matter, as raisins (and grapes) have been shown to cause kidney failure in some animals. At this time, we are unsure what causes this problem or why some animals are unaffected by ingestion while others become severely ill. It is best, however, to not put your pet’s kidneys to the test. Another commonly overlooked Valentine’s Day pet danger are artificial sweeteners such as xylitol. Sugar-free candies, gums, mints, baked goods, and even peanut butter may contain this toxic substance. When ingested, even a small amount of xylitol can cause a life-threatening drop in blood sugar. In some unlucky pets, liver failure may also ensue. The prognosis for xylitol ingestion is very good, however, if it is caught early. Be sure to keep your Valentine’s Day chocolates out of the reach of your furry sweethearts, too, as many will help themselves. A closed cabinet or refrigerator is safest. If you do think that your pet may have ingested a potentially toxic substance, be sure to seek medical attention right away. Toxin ingestion is a pet emergency, and speedy treatment is often the most effective treatment. Be sure to read the labels on your Valentine’s treats and keep potentially harmful products to yourself. Your Whitman’s Sampler is probably best reserved for humans only.